Naturisimo's latest Discovery Box has gone on sale today, and it contains everything you need to get gorgeous, healthy looking hair this Summer. 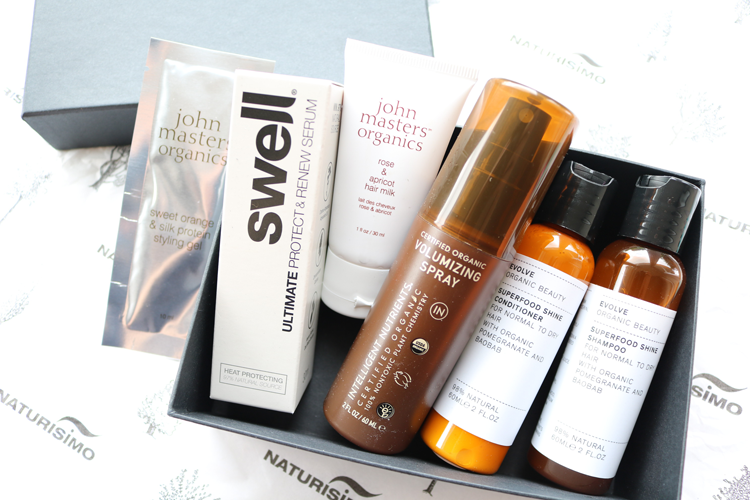 The new Gorgeous Hair Discovery Box has been expertly put together by the amazing team at Naturisimo and it features an array of luxury natural and organic haircare. A lot of these brands are quite pricey to buy on their own, so the Discovery box offers a great way to try out some lovely high-end products in mostly generous deluxe travel sizes, which are also perfect for your holiday and weekend bags. Although I'm familiar with these brands, all of the individual products are new to me and I'm really looking forward to trying them out. The Evolve Shampoo & Conditioner are both organic, SLS and silicones free, and are full of great natural ingredients to add shine, softness, and strength to normal and dry hair types. I particularly like the look of the Intelligent Nutrients Volumizing Hair Spray as it promises to give volume, bounce and hold to dry hair, and my hair is notoriously difficult to style! I'm a big fan of Swell and their Ultimate Protect & Renew Serum is a new release from them, plus it's formulated without silicones which is something that I struggle to find in a lot of hair serums. I also love John Masters and can't wait to use the Rose & Apricot Hair Milk which is a light, leave-in-treatment to defrizz, moisturise and add shine to dry and damaged hair. Less excited about the Styling Gel as I don't tend to use them myself, but I know a friend who will love it so I'll be posting it off to her shortly! I ordered this today. Looks really good! I'm pretty excited by this one. So much so I bought a second one!